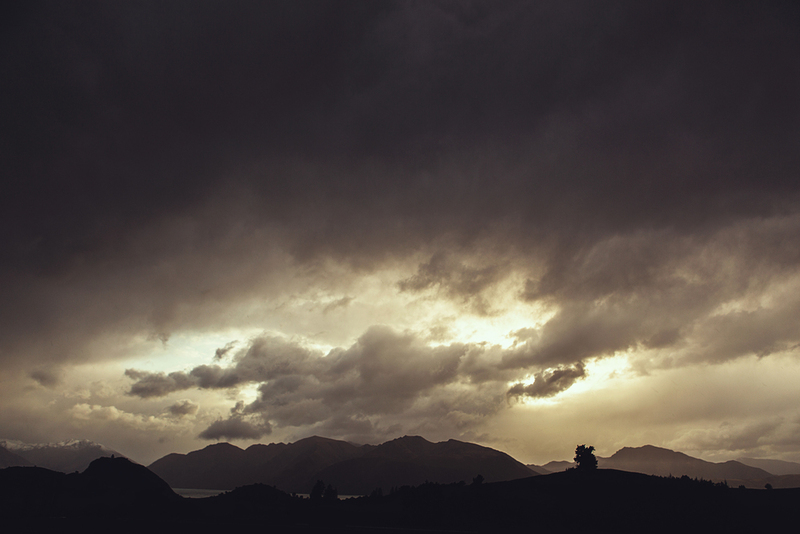 I greeted my first day in Wanaka by heading down to the lake to photograph "That Wanaka Tree." 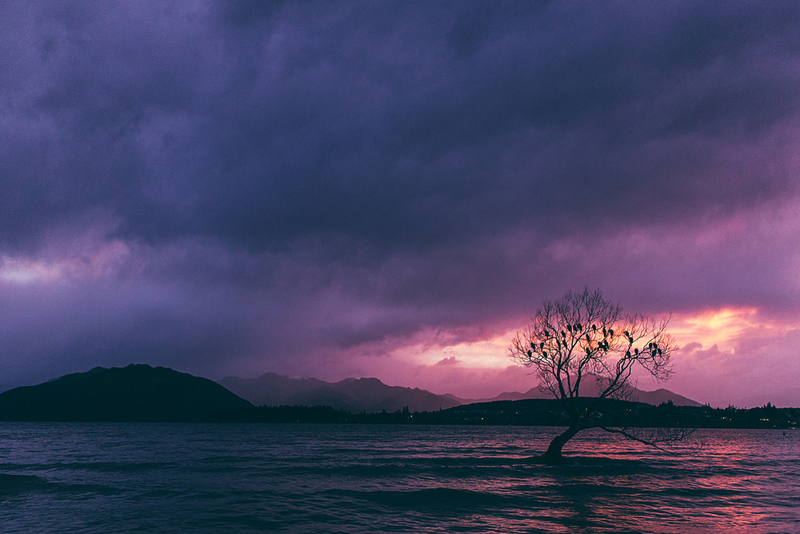 The iconic tree was bare-its foliage replaced by crows-as the sun rose across the water behind the town. The fast moving rain clouds parted just enough to let some of the purples and reds spill in. It was soon dark though. Rain fell and I retreated to a nearby coffee shop to figure out alternative plans. Since I couldn't do the hikes I had planned on, I ended up just taking the drive toward Rob Roy Glacier in Mount Aspiring National Park. Through mist and cows I drove along the valley as the surrounding green slopes were bisected by slashing torrents of white water filtering all the way down from the ice caps high above. My drive was cut just short of the short trail to the glacier when one of the fords looked just a bit too ambitious for my RAV 4 to handle. On the way back into town, the rain abated and sun broke through the clouds intermittently. Bright, complete rainbows arced across the sky between mountains above green fields. 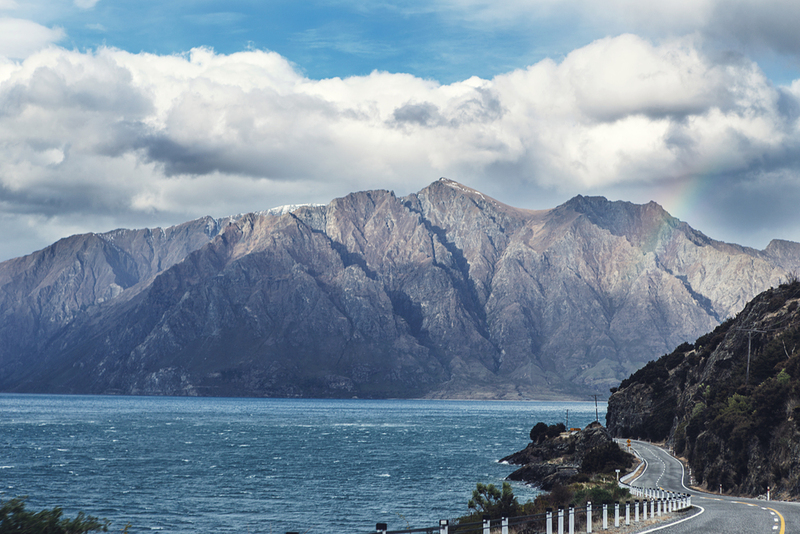 Hoping the sun would hold, I sped back up north the way I had come the previous night along Lake Wanaka and Hawea to see if I could check out the Blue Pools. The roads that I had come over in the dark yielded spectacular views of the surrounding lakes during the day. Winding dramatically along cliff faces over the water across from countless towering rock monoliths. Powerful winds blowing criss cross patterns of whitecaps on the lakes and speeding the clouds overhead. When I did arrive at the Blue Pools trailhead, it began pouring, as if on cue, as soon as I had parked the car. With only a couple of hours before sunset, I called it a day and headed back to town to grab dinner and check 50 different forecasts for any signs that the weather the following day would be more merciful.